Taika Waititi is the perfect choice to revive and rebrand Thor from the slump of the last film. His style of visual storytelling, in films like “What We Do in the Shadows” and “Hunt for the Wilderpeople”, fits perfectly in the Thor universe, especially with how heavily steeped in Norse mythology the franchise is. His comedic timing and acuity for visual gags, along with the vibrant color palette, stimulate the cinematic experience and elevate it from the grim grayness of the former films. Waititi completely revamps the film’s overall tone into something equal parts whimsical and sardonic. He takes the similar approach James Gunn took for “Guardians of the Galaxy” and emphasizes the wonders of the universe and gives us a feast for our sense, all while reminding us what a dangerous place it can be. That “dangerous place” sometimes looking dangerously similar to something out of “Lord of the Rings”. To say that this film is much more animated than the previous two is an understatement, which makes sense when you consider that most of the writers have written for Marvel television shows and cartoons. Writers Eric Pearson, Craig Kyle, and Christopher Yost create the kind of story that is meant to entertain your children but also offer adult-themed fun. I’m not just talking about spaceships made for orgies or having Thor say a swear word, but an engaging adventure. The humor is there, and the punchlines are witty, but much like cartoons, the character and emotional development comes on the shallow side. 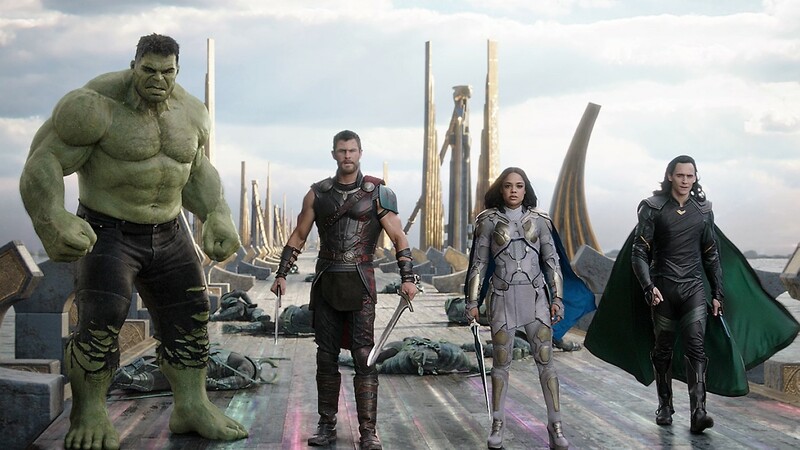 Taika Waititi may have given the Thor franchise the renovation it desperately needed, but the final third of the film proves to have the same pitfalls as many of the films before it. I’m not just talking about “Thor” and “Thor: The Dark World” but the entire Disney-led Marvel film universe as a whole. The final third of the film almost seems incongruous to everything we have seen up to that point. This is where the big, epic boss battle takes place and dominates the rest of the film. Not to say that it wasn’t well-done because the visual style was exactly what we have seen in the mass scale battles in “Avengers”, “Guardians of the Galaxy”, “Iron Man 3”, etc. The problem becomes that the two aren’t blended well together tonally. The lively energy and almost whimsical attitude turns overwhelmingly bland in the massive battle where we are forced to watch as the fight plays out exactly how we knew it would. There is always a tinge a dissatisfaction that comes from having to go through the motions, especially in a film that started out doing anything but.